Once you make home made ice cream and you realize how easy it is you suddenly stop being satisfied by what you find in the market and you end up trying to make different types and flavors I have to admit that once more I set myself a challenge and decided to make Chocolate Parfait Ice Cream. The recipe is a bit more complicated but the result is definitely more sophisticated. I have realized that parfait is not a well known type of ice cream in the UK, so I had to explain it to my friends that tried it. Despite the fact that they make it sound easier than the normal ice cream recipe as far as the freezing is concerned the baking process is actually more challenging. This specific recipe is from a famous in Greece baker. Her name is Michele Volonaki and she is a French lady that got married to a Greek. Apart from her well known TV series she has written a few baking books as well as marketed a line of desserts both in stores and a bakery chain in Greece. My aunt had the honor of meeting Michele Volonaki a few months ago and as they got to know each other my aunt showed her my blog. Michele Volonaki liked this blog and gave me permission to bake and publish her recipes. 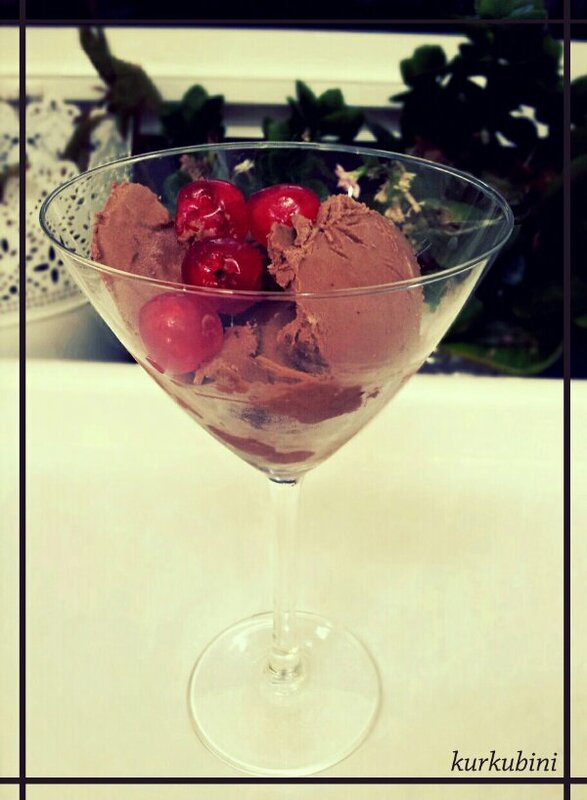 I was very excited with the feedback I got and I decided to start by trying her Chocolate Parfait Ice Cream recipe. I have to admit that the texture, sweetness and balance of chocolate in this recipe are amazing! Every single person that tried the ice cream commented on all of the above. What impressed them was that despite the fact that it is a creamy and velvety ice cream the taste of the chocolate stays strong in your mouth. In a mixer we beat 200g of sugar with the eggs until the mixture doubles and becomes light white. In a pan we boil the milk with 50g of sugar. We mix the egg mixture with the boiled milk in a heatproof pan or bowl that also has a handle. In another pan we boil water until it reaches the temperature of 70°. We place the heatproof pan in the boiling water being careful to keep the heatproof pan floating and not to let the bottoms of the pans touch each other. In baking this way of cooking is called bain–marie We let the egg mixture cook well and then removing it we place it in the mixer and beat it until it cools down. In a bain-marie we melt the dark chocolate and we add 350g of it in our mixture. We then beat the final ingredient of our ice cream, the double cream, in the high speed of the mixer until it turns into whipped cream and add it in the ice cream mixture. In a container we spoon half of the ice cream. We then pour the remaining 50g of the chocolate on top of it and finally spoon the rest of the ice cream on top. The dark chocolate will harden in the freezer giving the feel of real chocolate when eaten. To make it more exciting when we spoon it in the container we can sprinkle nuts, glazed fruits or syrup! Enjoy and as always use your imagination while making it!